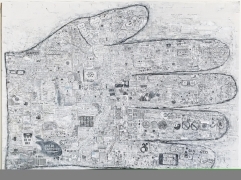 SIMON EVANS, Glove, 2016, Mixed media on paper, 45 9/16 x 65 3/16 x 1 1/8 in. 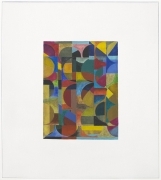 BEATRIZ MILHAZES, Mariola, 2015 , Aluminum, brass, copper, acrylic, hand-painted enamel on aluminum, polyester and paper flowers, foiled paper, woodblock, screenprint, 89 x 42 x 32 in. 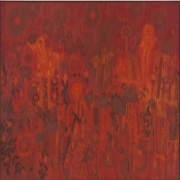 LEE MULLICAN, Transfigured Night, 1962 , oil on canvas, 75 x 75 in. LEE MULLICAN, Meditation on a Landscape, 1963 , Oil on canvas, 36 x 24 in. MICHELLE GRABNER, Untitled, 2016, Bonze, 25 1/4 x 12 x 8 in. 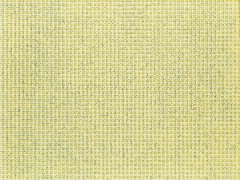 MICHELLE GRABNER, Untitled, 2016 , Oil and gesso on burlap and panel. 90 x 120 in. FRED TOMASELLI, Blue Circles, 1995, Pills, acrylic, resin on wood, 74 x 52 in. SCOTT OLSON, Untitled, 2016, Oil on linen, maple frame, 27 1/2 x 23 1/2 x 1 in. 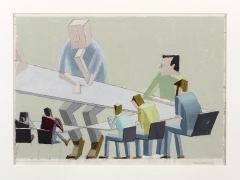 MERNET LARSEN, Faculty Meeting Study, 2006, Acrylic on Bristol board. 19 x 24 in.